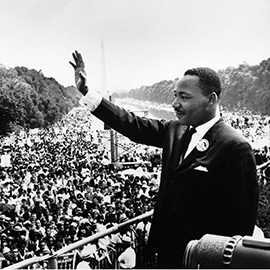 LAURIER ACKNOWLEDGES THE LEGACY OF DR. MARTIN LUTHER KING JR.
Wilfrid Laurier University joins with all those who support justice, diversity and inclusivity in remembering Dr. Martin Luther King, Jr., who was assassinated 50 years ago today, on April 4, 1968. King's life reverberates across the decades for his leadership of the U.S. civil rights movement. His contribution to all of humanity has been to recognize the inherent dignity of every individual and their rights as human beings. His life of leadership and service is an inspiration to the Laurier community.